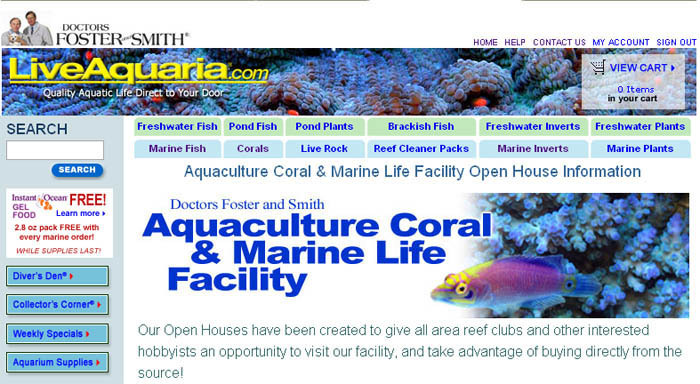 Doctors Foster and Smith announced yesterday that they will be providing 45 minute behind-the-scene tour of the liveaquaria aquaculture coral and Marine life facility. The guided tour will cover everything from filtration equipment, information about their fish, coral and invertebrate holding system, and a closer look at their extensive quarantine and conditioning procedures. 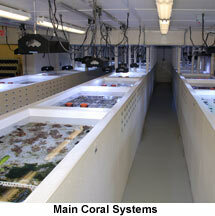 Visitors will be able to purchase any of the available aquatic life not already sold on Diver’s Den. In addition to the tour, each guest will receive a FREE raffle ticket, making them eligible to win one of many popular aquarium products or livestock. You can reserve your ticket by emailing Tours@LiveAquaria.com. Saturday, June 19th, 2010 – half full! Sign up soon! The Open House starts at 12 (noon), CST at the facility. Facility closes at 4pm. The Retail Store is open from 9:00-5:00 pm CST. Specimens from the facility are available for purchase at the completion of the formal tour. Purchases must be taken home the same day of the scheduled tour. Please Note: The only accepted form of payment is a valid credit card or a Drs. Foster and Smith/LiveAquaria.com gift certificate. Adequate staffing will be provided for questions and consultation with guests. * Children under 16 years of age must be accompanied by an adult and supervised at all times.